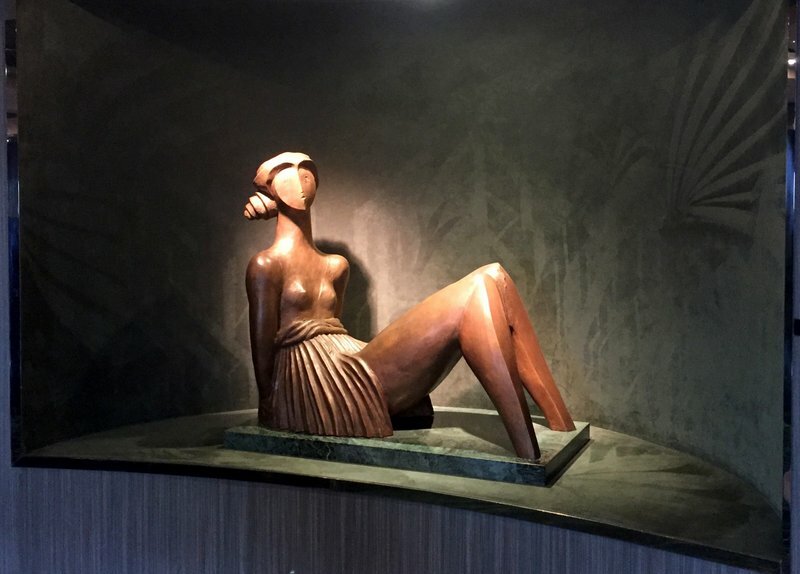 Massimo Bertolini, title and date unknown, bronze, aboard MSC Splendida, 2016. Photo credit Kelise Franclemont. Art, it has been said, “is in the eye of the beholder” but when half-ton marbles on plinths appear in every corridor on MSC’s larger ships, I have to wonder, are they still works of fine art, or have they been relegated to serve only as décor, to be no more appreciated than a lamp in the corner. On a recent holiday, I decided to treat the sculptures encountered as I would any other exhibition on land, and tried to find out more about them. 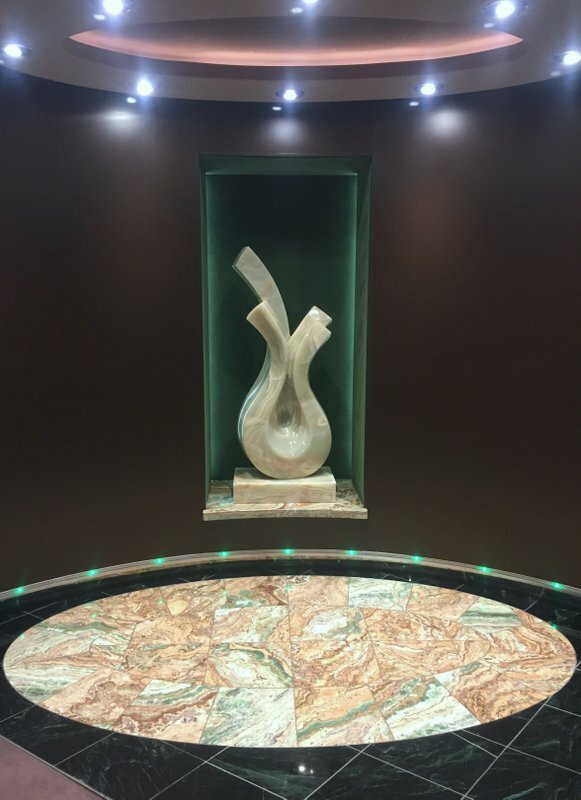 Artist, title, and date unknown, aboard MSC Splendida, 2016. Photo credit Kelise Franclemont. 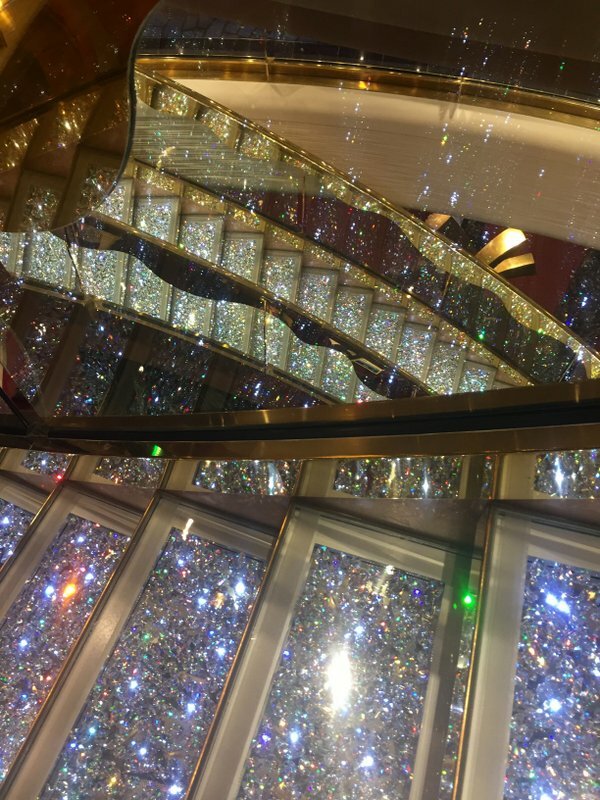 Detail of Swarovski staircase, aboard MSC Splendida, 2016. Photo credit Kelise Franclemont. 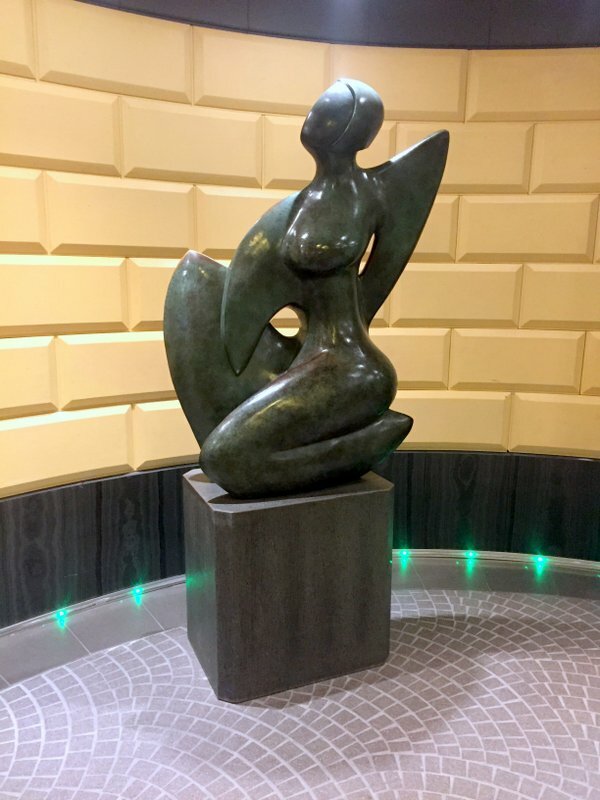 So when I noticed around 20 charming sculptures ensconced along the public gangways, the researcher in me accepted the challenge to discover what I could about them, not least of which, the name of the artist (or artists). A little bit of a task, actually, when the artworks are not labeled, and MSC’s website offers no info about their interior design. Which are also bolted to the shelf so I can’t lift them to see if there’s an artist’s name inscribed beneath (and nor, I suppose, can I lift them into my luggage on the way out the door)… They do remind me of the “book” sculptures by Azerbaijani-Russian artist Aidan Salakhova (check the link, you’ll see what I mean). 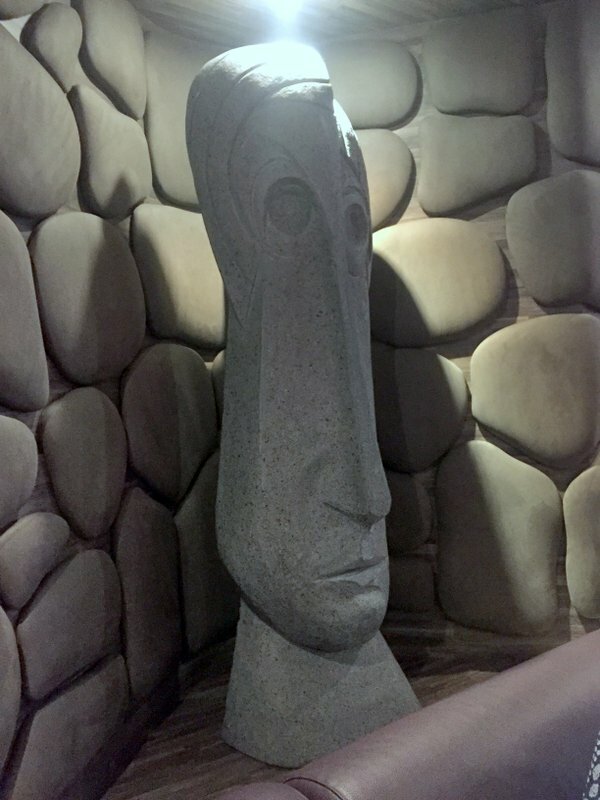 There is a set of sculptures, a little different from the others, in the spa area. These rather androgynous figures are shaped in wood or marble, winged and flightless. A brass tag attached designates Massimo Bertolini, an Italian artist out of Pisa. Bertolini seems to have been most active in the 80s and 90s (incidentally when much of MSC’s current fleet was acquired), yet still exhibiting, most recently in October 2016 in Pietrasanta, Italy. Massimo Bertolini, from ‘L’Orizzonte’ series, date unknown, wood, aboard MSC Splendida, 2016. Photo credit Kelise Franclemont. Massimo Bertolini, from ‘L’Orizzonte’ series, date unknown, marble?, aboard MSC Splendida, 2016. Photo credit Kelise Franclemont. I can’t be sure, but these reclining figures, too, may also be Bertolini’s work, when compared to his “Sitiuazione precaria” series from 1984. There’s not much else left to say but, like most art in banks or hotels, the works here are, of course, inoffensive, finely made, aesthetically pleasing, and fit the context. Also, unlike the disreputable art auctions on other lines, none of the art here is for sale, existing solely for whatever the viewer will make of it. Then there’s this guy in the ship’s party bar, aft of the ship, silently brooding over my shoulder and hopefully not judging me as I sipped my 3rd Cosmopolitan of the night. In the end, my research came up short and I’m unable to name the artists of these fine sculptures; nonetheless, I enjoyed my art scavenger hunt at sea, quite a nice diversion in a long afternoon between ports, and affording a little moment to appreciate the transformation of an idea to physical form. At risk of looking like an endorsement, check out MSC Cruises for yourself – among other things, you can take a virtual tour of the decks, to get a feel for the context in which these sculptures are placed.